The charge to the teachers and administrators from eight school districts seemed simple enough: Create an activity, called a performance assessment task, that would show, when solved, that students understand a unit covering Common Core standards that California and 45 other states and the District of Columbia have adopted. Really understand, not by simply choosing a multiple-choice answer, but by explaining or illustrating in multiple ways the depth of their knowledge. The exercise, done in teams of six or so, divided by grade and subject, over 2½ days in Berkeley last month, was difficult, sometimes exasperating but also enlightening. For many, it offered a revelation: Replacing the California state standards in math and English language arts with Common Core will require not merely learning new standards but also adopting a new mindset and approach to teaching essential concepts in depth. For some teachers, there will be the stark realization that they don’t have the content knowledge of math that Common Core demands. For districts and teachers for whom Common Core remains an abstraction or a headache to be dealt with later, that news will come as a shock. With the introduction of Common Core standards, “we are asking teachers to view teaching and learning differently,” said Olivine Roberts, the chief academic officer of Sacramento City Unified. 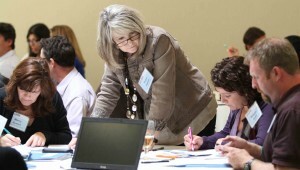 “The change can be uncomfortable.” Sacramento City, which is farther along than most districts in implementing the new standards in at least a few grades, was one of the districts at the Common Core training last month. Collectively, the eight K-12 districts – Los Angeles, San Francisco, Long Beach, Fresno, Oakland, Sanger, Clovis, and Sacramento City – comprise CORE, the California Office to Reform Education. The Summer Design Institute was their first joint venture in training teachers for the Common Core. The leadership of CORE, the eight superintendents, and, from what I could surmise, those at the conference were convinced that the new national standards are superior to the current California standards. Teachers will spend more time on fewer standards, trading breadth for depth with the goal of developing problem solving and critical thinking skills. Supporters say Common Core standards are more coherent and better integrated from one grade to the next. The new end-of-year tests, which will replace the California Standards Tests, are to be more demanding, requiring students to demonstrate a conceptual understanding as well as mastery of specific skills. All of this may prove true, but the immediate challenges of implementing Common Core standards are daunting. The preferable way of implementing standards – the logical process that California phased in from 1997 to 2003 – is to adopt detailed curriculum frameworks, which lay out strategies and guidance for teaching the standards; approve and buy textbooks and instructional materials; and thoroughly train teachers before students are held accountable for end-of-year or summative assessments. With Common Core, there’s no time or state money for that sequence. The end-of-year Common Core tests, which a consortium of states, including California, are devising, are to be administered in 2014-15, less than three years from now. The math curriculum frameworks that California is developing will be adopted in November 2013, with the English language arts frameworks to follow in May 2014. Formal textbook adoption won’t happen until 2016 in math and 2018 in English language arts, although an interim review of materials is happening this year. The state Department of Education is promising to post online teacher training units this fall. But for the most part, when it comes to professional development, it’s pretty much every cash-strapped district and county office for itself. The staff of CORE are also planning to draw from the expertise and online resources of other states, particularly those – like Massachusetts – that have used Race to the Top dollars to leap ahead with Common Core. That’s the one big advantage of participating in a national effort. Math authority Phil Daro speaks at the CORE Summer Institute. Phil Daro, who has devised large-scale math professional development programs for states and had a hand in developing Common Core math, praises that intent and says it’s about time California worked in concert with other states. “California has been so insular for decades. We talk to ourselves and haven’t looked at what other states have been doing,” he said during a break at the Summer Institute, where he was a keynote speaker. More than a million students attend the CORE districts. Their districts’ size (they include the state’s first, third, and fourth largest) and their willingness to work together and to share their work online for free with the rest of the state have attracted philanthropic dollars. California Education Partners, the Stuart Foundation, the Hewlett Foundation, and The James Irvine Foundation are underwriting CORE and funded the $276,000 cost of the Summer Design Institute. The districts sent 128 teachers and academic coaches and 27 district leaders – covering grades 3, 5, and 7 in math and 1, 4, 7, and 9 in English language arts – to the Institute. There they heard national specialists – Daro; psycholinguist Kenji Hakuta of Stanford; WestEd’s director of standards and assessments Stanley Rabinowitz; and Margaret Heritage, a data, teacher evaluation, and assessment expert at UCLA – address Common Core themes and issues. The CORE superintendents proposed organizing the Institute around performance assessments. “The assumption is that a teacher who can create an assessment that checks students’ understanding of the standards, then adjusts teaching based on students’ needs is an effective teacher,” said Rick Miller, a former deputy state superintendent who is now the executive director of CORE. The Common Core standards devote a lot of attention to fractions as a building block of algebra, which most students under Common Core would take in ninth grade. Since California’s state policy for the past decade has been to push more students to take algebra in eighth grade, defenders of the current state standards have attacked Common Core math standards as less rigorous. “The Common Core standards are mediocre: They are clearly better than those of about 30 states, as good as those of about 15 states, and clearly worse than those of three states, California among them,” says Ze’ev Wurman, a software engineer from Palo Alto, who was a member of the Mathematics Curriculum Framework and Criteria Committee that developed California’s 1997 mathematics framework. Supporters respond that some students will be ready in eighth grade, but those who aren’t will be better prepared for algebra a year later, with fewer ending up repeating the course. Teachers won’t have to spend time teaching what students should already know. At the Institute, Brann and Roberts joined four teachers from Sacramento City and Los Angeles Unified at a fifth grade math table, where they worked on creating a performance assessment involving equivalent fractions, like 1/3 and 2/6, and the addition and subtraction of fractions. The group struggled to come up with everyday situations that students could relate to. Roberts reminded the group to start with the result – what evidence of proficiency teachers will want to see – and then work backward to construct the activity to elicit it. It’s Carnival Day at Sunshine Elementary, and you, Marcus and Tamra are excited. Part 1: One of the games is to test your strength. You hit a button with a hammer and it shoots a metal ball up toward a bell. Tamra’s ball went 2/3 of the way up, Marcus’ ball went 3/8 of the way up and your ball went 1/4 of the way up. What is the difference between the highest and the lowest? How do you know? Part 2: Tony has been watching you. He laughs and says that all 3 of your measurements together would not reach the bell. Estimate using benchmark fractions to see if Tony’s correct and explain and justify your position. Part 3: Each student at the carnival gets one Cruncher Bar. Marcus has eaten 3/5 of his bar, Tamra has eaten 2/3 of her bar, and you have eaten 5/8 of yours. What is the total amount of candy that you three have eaten? How much more did Tamra eat than Marcus? Explain in words how you got your answer. Part 4: Marcus claims that if you put the leftover parts of the 3 bars together, it would be more than a whole bar. Tamra doesn’t think this is true. Which of your friends is correct? Use numbers, words and pictures or diagrams to resolve the argument. An assessment, involving multiple standards, asking students to explain their understanding through pictures, number lines, graphics, or words is different from the multiple-choice tests that many students have been used to. Teachers will have to teach math differently, too. Traditional textbooks, with scripted instructions teaching one standard at a time, won’t be sufficient for developing the mathematical reasoning that is Common Core’s objective. 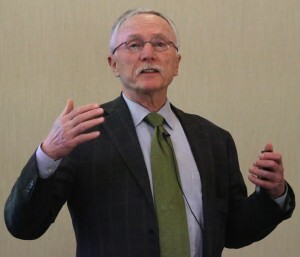 Relying strictly on teaching algorithms, procedures, and tricks (see the “butterfly” method to add and subtract fractions) to get a right answer won’t help students explain the concepts underlying the answer, Brann says. A California Department of Education website on work of the Smarter Balanced Assessment Consortium, which is preparing the summative or end-of-year Common Core tests. Copies of the math and English language arts Common Core standards, as adopted by California, along with the state’s implementation plan and a video explaining the Common Core standards at this California Department of Education website. An explanation of the difference between formative and summative assessments. Update on the work of the California Department of Education on Common Core (Agenda item #1 for the July 18, 2012 meeting of the State Board of Education). That experience can be intimidating to teachers, or, Rick Miller says, it can be empowering. “Common Core gives teachers the opportunity to take control of the classroom,” Miller says “and become engaged in how their students learn.” It can free them from a pacing guide tied to a single textbook, both in math and English language arts. Phil Daro, the math expert, says that he would make teaching math content to elementary teachers a district’s top priority. Many elementary teachers’ lack of math content knowledge has been a problem, he says, and that will become evident with the rollout of Common Core. Daro recommends creating “book clubs” at schools where teachers can regularly review math content together, and he urges “over the shoulder” collaboration, where teachers can observe one another’s practice. Teachers at the Summer Institute will try out in their classrooms this fall the two-dozen performance assessments in math and English language arts that came out of the Institute. There eventually will be a library of hundreds of performance assessments given over the course of a year that CORE will post online. Some will be developed locally, others chosen from other Common Core states, and some may be available from Smarter Balanced, the consortium of states that is creating the end-of-year Common Core tests. The bank of examples will save teachers the time and effort of having to develop the items themselves. But the goal is for every teacher in the CORE districts to go through the experience of creating their own, in conferences like the Summer Institute or district workshops. “Every teacher needs to go through the process, for the process is the learning. It’s laborious, but it’s what needed to create a shift in instruction,” says Sacramento City’s Olivine Roberts. There are tens of thousands of elementary and middle school teachers in the CORE districts. The Summer Institute was but a very first step. John Fensterwald is the editor of EdSource Today. Contact him at jfensterwald@edsource.org. I am baffled at how people with higher degrees can be so ignorant of the obvious. One of the reasons our schools are failing is because of the percieved, need to continually rewrite curriculum. Why is it in the 20th an 21st centuries we have the need to continually reinvent the wheel. The classical methods that supported the rise of Western Civilization have been all but abandoned and no one ever questions that maybe instead of looking to some new modern methods all we need to do is look to the past to what once made the West the envy of the world. I was recently appaled to see my son’s (now in 4th) second grade math text book, every page introduced a different concept and only provided one, maybe two exercises before introducing a totally new concept, not to mention one of the concepts being introduced was statistical means, a concept only a genius 8 year old could possibly understand. What ever happened to teaching mastery of a concept before moving on to the next. This is essential in Math. What is being done to our children is criminal. Why dont we return to the classical meaning of grammar school? Kids at this age need to learn facts and rudementary methods. I know teaching facts utilizing wrote memorization became boring for teachers so in order to make teachers jobs less monotonous new methods had to be invented. This however was not done for the benefit of children, nor was their any research to support its benifit in learning. Primary school children’s minds are not developed enough to make analysis of many of the difficult concepts being introduced to them today. A childs mind is for the most part a blank slate. It first needs to be filled,with information before it can even begin to evaluate it. Analytical skills,need to be left to the last four years (9th thru 12th) of school. Found in paragraph 3, “For some teachers, there will be the stark realization that they don’t have the content knowledge of math that Common Core demands.” I have long felt this would resonate through the process of migrating from the comfort of what we know to the temporary wilderness of the new and unknown. It is my greatest desire that new teachers, especially first-year teachers, will not be discouraged by the experience. For them, it will be more like what it was like for me when I was a first-year teacher who had to create all manipulatives needed for teaching in my mathematics classroom. Before Cuisenaire and textbook publishers mass-produced sets to support textbook lessons, it was mat board, foam-core board, and dried beans were cut and counted into classroom sets. I was so glad that I had seasoned teachers explaining and sharing management tips. The biggest reason I made it was due to the giants who saw promise in me, invested time in me, and that they were there to answer the question I asked my first year which saw me through the tough times, “How long did you teacher before you felt like you had a firm grasp of what you are teaching?” The answer, ‘Three years!” calmed my fears and helped me set a goal of how long I would keep going before I made a decision whether or not to give up. I am glad to say that I never had to give up and I have had the privilege of encouraging so many new teachers over the years. After watching younger students for years, when provided opportunities to investigate and talk about math, I find that they are quite capable. As with any process, it takes time. We have, for so long, only asked students to come up with the “right” answer that we have carelessly avoided any determination of mathematical understanding. This is why our students struggle in algebra; as math becomes more abstract, if we don’t have a strong foundational understanding of the interrelationships of numbers and fractions we can’t apply those concepts in any meaningful fashion and we rely solely on memorization of algorithms. That is like trying to repair a carburetor without understanding its relationship to the vehicle. When we first begin to ask our students to analyze and discuss, of course they will balk as young students aren’t frequently asked to discuss much of anything, particularly those in impoverished homes (see the research of Shirley Brice Heath). To test the lack of understanding try asking a fifth grader to explain multiplication; chances are they will only describe the memorization process. I have watched second grade students, in a low income school, describe how they solved fraction problems using the Cognitively Guided Instruction (CGI) process. Truly, their ability to problme solve and reason would astound anyone. El, you bring up a concern I have had throughout my career in education: that of low expectations and sellin gour students short. Ze’ev, look a little close at the problem and you will see that a studnet must “understand” equivalent fractions in order to answer the questions. The benefit of a problem like this is the discussion that it promotes. Research shows that when students discuss, debate, and explain, they learn. The “explain your answer” idea makes sense on some levels, but I find that young kids especially are flummoxed by it, especially those who totally get the material. “What’s to explain?” they ask me. They end up doing the equivalent of talking slower and louder with the same words, grumpily. The idea is sound but in practice I can’t say that I’ve seen it improve my daughter’s writing nor her understanding of math. Is there any data or experience that suggests that it does? Is there a better way this idea might be implemented? And maybe it works better for older students whose grasp of language and ideas is more thorough. Sounds so wonderful … until we see the inane exemplar of what they came up with. I don’t know where to start critiquing it as the word limit on comments won’t suffice. Perhaps pointing out that it does not even address the standard it was supposed to address — equivalent fractions — will suffice. I find this piece a perfect example of what is so often wrong with reporting on education. Reporters are unwilling — and often unable — to apply judgment to the actual subject matter. Does it really require anything beyond straightforward algorithmic addition and subtraction of fractions? Does the required “explanation” contribute anything beyond jerking students around and making them write meaningless pabulum on the problem just solved? Does it exemplify anything deeper than can be trivially and inexpensively tested with four regular multiple choice items? I find it all deeply frustrating. When it comes to curriculum, too often we seem to defer to “experts” rather than use our own common sense. Even you, John (smile). Ze’ev: Thanks at least for crediting my accuracy in capturing the perspectives of the speakers and participants at the Summer Institute (smile back). In two years of reporting on Common Core math standards, I have written about the strong disagreements on whether the current California standards or the new Common Core will better achieve the goal of enabling high school students to become proficient in math and capable of applying their knowledge in their careers and everyday lives. At least in California, you and other defenders of existing standards hold the minority view. I suspect the answer is not as clear-cut as you portray. I believe you are correct that adoption of the Common Core standards will lead to fewer students taking Algebra in eighth grade, especially if all of the California algebra standards that you persuaded fellow members of the California State Academic Standards Commission to append to Common Core are stripped out. You may be overestimating the decline, however. Given that about half of eighth grade Algebra students are currently required to take the subject again in ninth grade (with many gaining a dislike of math as a result), the better gauge may be the percentage of students who are proficient in Algebra and Geometry at the end of 10th grade. But, of course, the Common Core summative assessment will be different from the multiple choice CST, so that too will complicate the comparison. How about considering improvement in NAEP scores in 2020? In the olden days we called those “word problems.” And we showed our work. These changes — and the destruction of the vastly superior CA standards — are driven by those who sell tests and textbooks. We have no money left for either. We have the same number of librarians as Connecticut. We’ve done away with art and music and shop and now we’re going to swing the pendulum once again. What’s the rationale behind the use of the phrase “number sentence” instead of “equation” ? Paul — No decisions have been made yet, but your question is a topic of discussion by the AB 250 Advisory Group which is advising the SPI for his recommendation for the re-authorization of STAR which is due to the legislature this coming November, with presumably the legislature taking up the topic in 2013. Discussion of your question is scheduled for the State Board of Education meeting tomorrow, Item # 4. The SBAC website mentions annual tests from grades 3 to 8 and once in grades 10 through 12, at least for math and ELA. Has any decision been made on having more testing than is minimally required by the federal government?